The monoextrusion die module of polyXtrue has been used to design and analyze many different types of dies including sheet and film dies, pipe and tube dies, as well as profile dies. Some of the die geometries designed by using polyXtrue are shown below. The polyXtrue software has been successfully used to design new monoextrusion dies as well as to optimize existing dies. 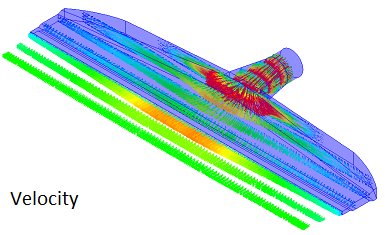 Using the computer simulation of the flow in extrusion dies with polyXtrue, you can develop the die channel geometry such that a uniform velocity distribution is obtained at the exit (die balancing), and the pressure drop in the die is minimized. A uniform velocity distribution at the die exit is important for uniformity and stability of the extruded profile. Minimization of the pressure drop in the die is critical for achieving high throughput, and hence, for economics of extrusion process. You will also predict the distortion in extrudate shape beyond the die exit. You can then modify the die channel geometry to match the predicted extrudate profile with the required shape of the final product. 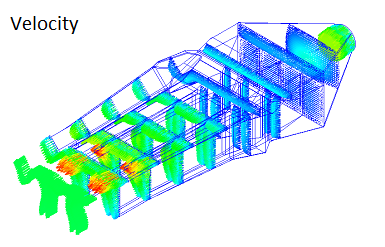 Two different options are available for optimization of monoextrusion dies using polyXtrue. 1. Purchase a license of monoextrusion die module of polyXtrue, and optimize your die design yourself. Plastic Flow will train you in the complete process of starting from die concept to achieving the final optimized die geometry.